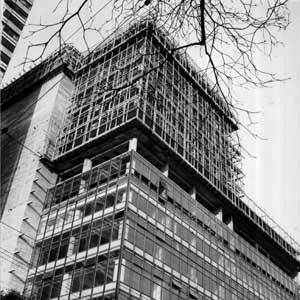 Gazeta Press – Construction the new building of Fundação Cásper Lïbero (50s). Created in August 15th, 1944, the Fundação Cásper Líbero fulfills journalistic, historical and patriotic objectives, following the principles determined by its founder. It is an institution without any profit-seeking finality. 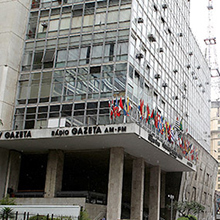 Its real estate is consisted by a building with 14 floors – The Gazeta Building. It is an area built by 68.000 square meters which house the Rádio Gazeta AM, the Rádio Gazeta FM, the Cásper Líbero University of Social Communications, the TV Gazeta and the portal Gazeta Esportiva.Net (formely known as “A Gazeta Esportiva”). Gazeta Press – The current building of the Fundação Cásper Líbero. The Gazeta Building also houses a theater with a 900-people capacity and, on its top there is the Rádio Gazeta FM antenna and the tower (with the digital and the analogic antennas) of the TV Gazeta, 85 meters high and that can be seen from any point of the city of São Paulo. History the communications coumpound of Cásper Líbero. The first building constructed in Brazil with all the appropriate characteristics for the elaboration, engraving, composition, printing and distribution of a newspaper. Extremely important in the defense of democractic institutions. Actions of social responsibility in the Fundação Cásper Líbero.